Mark Dredge - Beer: The Next Twissup: You Decide! We’ve done Sheffield (pictured below!) and Burton, now it’s time for the next glorious Twissup. The date will be Saturday 23 October but we haven’t selected the final destination yet, so we’ll throw it open to a vote. The idea is a good pub crawl between two different locations. Choice 1: Manchester-Huddersfield: We’ve talked about this one for a while. Start in Manchester as it’s easiest for most people to get to, head to the Marble Arch and maybe another stop in town, then to the station for the train to Huddersfield. We stop at a few stations for a beer on the way (on the Rail Ale Trail! ), jumping on and off at the best places (this should help). In Huddersfield we have a few more pubs, probably ending at The Grove. Then back to Manchester or stay in Huddersfield. 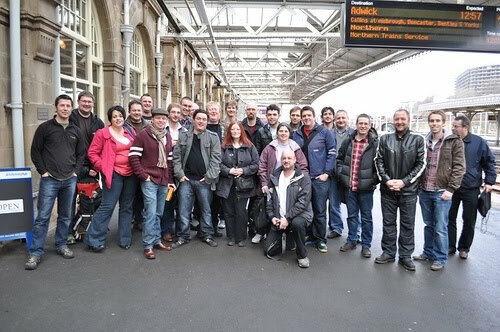 Choice 2: Leeds-York: North Bar for starters and some other stops at Leeds’ finest, then over to York. Check out Blog O’ Beer and Andy’s post for a peek at what’s there. There’s also Pivo which is run by the same guys as The Sheffield Tap and we might be able to get York Brewery in on it, if we ask nicely. Then people can head home in the evening or stay in either Leeds or York. I'm going to abstain. It's either 4:30 or 4:53 on the train depending on destination! Sigh...I'll be in Bristol that weekend. Last weekend October 2011 - Amsterdam for Bokbier Festival(and numerous great bars) plus train to De Molen one afternoon? I've drank in all four places many times and here are my pros and cons. In Leeds, North Bar is great but expensive. Mr Foleys is pretty good but the selection is hit and miss. Not a great deal more in Leeds apart froma few Nicholson's pubs. On to York - Rook & Gaskill is great with 14+ Hand Pull, but the staff are a bit unwelcoming. Pivo is great but very small, we'd never all get in there at one time. They have about an 8th of the selection of Sheffield Tap. The Maltings is a great pub but if we get there too late on a Saturday we will be turned away due to being a large group as it is Hen/Stag Night central. Brigantes is a great pub, love it! Most of the good pubs in York are pretty small. I love York, its a lovely city. But getting close to Xmas it goes bonkers. So many people its unreal. A good place for a group of 8 max but the pubs can't cope with 20+ in one gang. I'd expect more people are excited to visit Marble Brewery. Plus Marble Arch is a fantastic pub, my favourite in the entire country. Plus we have contacts at Marble too so a tour would be easier. Not much else to see in Manchester pub wise tho. Marble Arch now do take-away cartons so we can grab one of those for the train. City are playing Sunday so it shouldn't be too busy. I'd personally skip the stops on the train route, it will swallow up valuable drinking time waiting for trains/missing trains. The the best Station pubs are in Hudds and Dewsbury anyway. In Huddersfield The Kings Head, Sportsman, Star and Rat & Ratchett are all great pubs. The Grove has the best range of British beers on tap I've ever seen. Permanant pumps for Brewdog, Gadds, Dark Star, Thornbridge (plus jaipur is always on), Durham, Marble, Fullers, An American guest pump (currently Runiation, next up is Big foot!...to give you an idea) A fantastic range of world beers in bottle at a great prices, nearly half the price you pay at North Bar. All the pubs mentioned are pretty well sized and could cope with bigger groups. Plus I'm sure Rich from MyBrewery Tap can have a word with most of the landlords as they know him and they can be expecting us. A warmer welcome you'll find in Hudds, Leeds and York will be a be busy and full of trendies on nights out on a Saturday. I'd advise not getting to The Grove too late as it gets very busy 7pm onwards. Well that was a bit one sided. Trust me, I'm talking from experience. Just look at The Grove's Beer List and drool! Not sure where you'tre coming from, but there are plenty of other great pubs in Mncr. The MA, great as it is, isn't the beginning and end of Mncr pub life. Remember, also, that many people will not be that familiar with the Mncr scene so it will all be an eye opener for them. This is a bad day for me as the National Winter Ales Organising meeting is that day. And Rob "trust me" and "Not much else to see in Manchester pub wise tho." sort of don't add up as Tyson says. Mind you Huddersfield has a lot going for it and they are quite compact. Now then Mark - I'll be joining this one, for once! Personally, I'd prefer Manc/Hudds simply due to it not being as familiar to me as Leeds. However, I'm easy. Both trips are local to me. York does get busy on an evening, but I don't think we'd have any trouble getting in anywhere - I just spent my stag do weekend in York last month on the same weekend as York races and needless to say, the sorts of places we'd be visiting (brigantes, the swan, etc) would be 'far from the madding crowds' so to speak. Not been out on an evening in Hudds, so that appeals thanks mate - see you all soon....! I'd prefer not to do 2 cities in one day. Manchester would be good, go to Marble Arch, then a few others, then onto Salford. Hudds is tops with Folly Hall area enough to satisfy. Leeds, not much up there is there? Apart from North bar and Arcadia i've never found many good places. Liek i say though, one city is enough in one day or we just end up rushing around like a stag doo pub crawl. I've been out in York too though and it was a good evening so fun times either way I expect! I'm happy to do either, can I just add to the Hudds trip that Tara at Mallinsons is more than happy to give us a tour and I can possibly arrange a tour with Elland as well if people would like. This will involve organising a minibus but i'm more than happy to do that. Ok, I guess I was over egging that a bit. Fringe Bar is good but their cask selection isn't great and despite the great prices of Belgian bottles I didn't think people would be wanting that at that time of day, but I do like the place. Cantillon is cheaper there than in most shops. Knott Bar is pretty good but is miles away. I've heard contrasting things about Black Lion, is it any good now? I heard The Angel is much better nowadays? The (?) & Kettle at the top of Oldham Street is ok. Yes I'm complete Marble-Fanboy so I'm a bit bias, I love the pub and their beer. But I'm more than happy to visit some good new pubs in Manchester, I'm always looking for new places. As much as I like Leeds and York, There is no where with as good a selection than The Grove in Huddersfield. Two place in one day shouldn't be that much of a hassle, we did much more traveling in Sheffield. Huddersfield is only about 25 mins on the train from Manchester. The Grove (currently my favourite pub) & the rest of Hudds really needs a separate day to do it justice. Ditto Mncr (6 National Inventory pubs etc) & Salford. So I do think the one-a-day approach seems the most logical option. Either is good for me, no real preference. 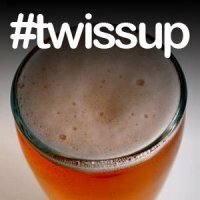 Consider my vote a vote for twissup in general.